I first read about the skirmish of Rottingdean in Lt. Colonel Howard Green's ‘Guide to the Battlefields of Britain and Ireland’. He described it as ‘a raid by French pirates’ because France was ‘too disorganised to mount a large scale retaliatory invasion’ to revenge Poitiers. Always one to investigate the obscure, I began collecting information on the skirmish and the persons associated with it. That was over twenty five years ago! From my research, it soon became clear that the Lt.-Colonel was mistaken. The raid was not an isolated one made by French pirates, but part of a well-organised naval campaign which had been carefully prepared by the king of France and his admiral, Jean de Vienne, during a two year truce with England. The Marquis Terrier De Loray, the nineteenth century biographer of Jean de Vienne, first described the following version of the 1377 naval campaign. It is still accepted by many modern historians without question. The Marquis noted that the admiral's fleet consisted of 120 ships, including 35 large ones owned by the King of France, and eight Castilian galleys commanded by Don Fernao Sanchez de Tovar. On board were four to five thousand troops, plus sailors and oarsmen. On 29 June, the Sussex port of Rye was sacked and burnt. Nearby Winchelsea escaped attack, as the abbot of Battle had rapidly garrisoned it. A landing was next made at Rottingdean, where the prior of Lewes was defeated and captured. Lewes was sacked and burnt and Folkestone similarly dealt with on 20 July. The fleet then moved on to Portsmouth, Dartmouth and Plymouth. In early August, it returned to Harfleur as the men on board had completed their period of paid service. There had also been a serious rift between Jean de Vienne and one of his subordinate commanders, the Sire de Torcy, on whether to hold Rye as a counterpoise for English Calais. Replenished, repaid, and with their leaders reconciled, the fleet put to sea again in mid-August to support the Duke of Burgundy's attack on Calais. Unfortunately, a gale blew the fleet to the Isle of Wight. The French successfully landed on 21 August, despite opposition by the inhabitants, and wasted the island before being repulsed by the garrison of Carisbrooke castle. After extorting 1,000 marks protection money from the island's remaining inhabitants, the fleet sailed onto Southampton and Poole where attempts to land at both places met with fierce resistance. The fleet then sailed eastward to keep its appointment with the Duke of Burgundy at Calais. On the way it attacked Winchelsea, but without success, the town being well garrisoned again by the abbot of Battle. However, Hastings was undefended and subsequently burnt. The fleet then moved onto Dover and anchored offshore. Finding the defenders alert and well prepared, the fleet crossed over to Calais. After spending eight days at anchor, another gale forced the fleet to put to sea on or about 10 September. The fleet subsequently returned to Harfleur, where it was disbanded. An early July date for the skirmish at Rottingdean? On the whole, the Marquis follows the sequence of events described by the chroniclers Froissart and Walsingham, supplemented with details from another, the Frenchman D'Orronville. However, there is at least one error in his account. Folkestone was burnt on St. Enswythe's day, which falls on 31 August and not 20 July. The other oddity is the timing of the skirmish at Rottingdean. Even though Froissart and Walsingham both place it after the landing on the Isle of Wight (21 August), the Marquis insists that the skirmish took place in early July. He was influenced by Froissart's comment that the French first heard of the death of Edward III (21 June) from prisoners taken at Rottingdean. He argues that it would have been inconceivable for the French to be ignorant of this important fact until late August. Nevertheless, the Marquis ignores Froissart's statement that the same prisoners also informed the French of the coronation of Richard II. Walsingham confirms a post-coronation date with his story of a mortally wounded Frenchmen, declaring to his captors, that England would not have been invaded if John of Gaunt had been made king. If this is true, the skirmish of Rottingdean could not have taken place before 16 July, the date of Richard's coronation. The Marquis was also influenced by D'Orronville's incomplete account of the 1377 naval campaign, in particular his statement that the inhabitants of Rye fled to the priory of Lewes after their town had been sacked and burnt on 29 June. To support this, he even points to the relative proximity of the two places. However, Lewes is still some distance away from Rye and it is more likely that the distressed inhabitants fled to the nearby walled town of Winchelsea, where the abbot of Battle had ensconced himself with his men as soon as he heard of the French landing. There are two more pieces of evidence that also point to a late August date for the skirmish at Rottingdean. Firstly, to supplement the forces available for the defence of the realm, the King asked his bishops on 25 July 1377 to arm and array all abbots, priors and ecclesiastical persons in their respective dioceses between the ages of 16 and 60. He also asked them to be organised into twenties, hundreds and thousands. We know that the Bishop of Winchester acted upon this request on 8 August and it is probable that the Bishop of Chichester, in whose diocese the priory of Lewes lay, did likewise roundabout the same time. Therefore it is unlikely that the prior of Lewes was captured bearing arms in early July. The same applies to Thomas Wilford, parson of Ardingley, who was also captured at Rottingdean. Admittedly, this argument is undermined by the abbot of Battle's defence of Winchelsea whilst Rye was being sacked on 29 June, but it is likely that the abbot was acting then in his secular capacity as one of the commissioners of array for Sussex. As such, he was responsible for leading the local levies in defence of the county. The prior of Lewes did not hold a similar appointment. The second piece of evidence is the date of death recorded for John Brocas in an inquisition post mortem held into his Kentish lands. Unlike, similar inquisitions held in Berkshire, Hampshire, Surrey and Sussex, the Kentish inquisitors recorded that John Brocas died on 27 August 1377. Is this the date on which Brocas was captured and therefore the date of the skirmish at Rottingdean? It certainly fits in well with the dates given for the landing on the Isle of Wight (21 August), the correct date for the destruction of Folkestone (31 August) and the appearance of the French fleet off Calais (early September). There is also a logical progression in these events, eastwards along the south coast. 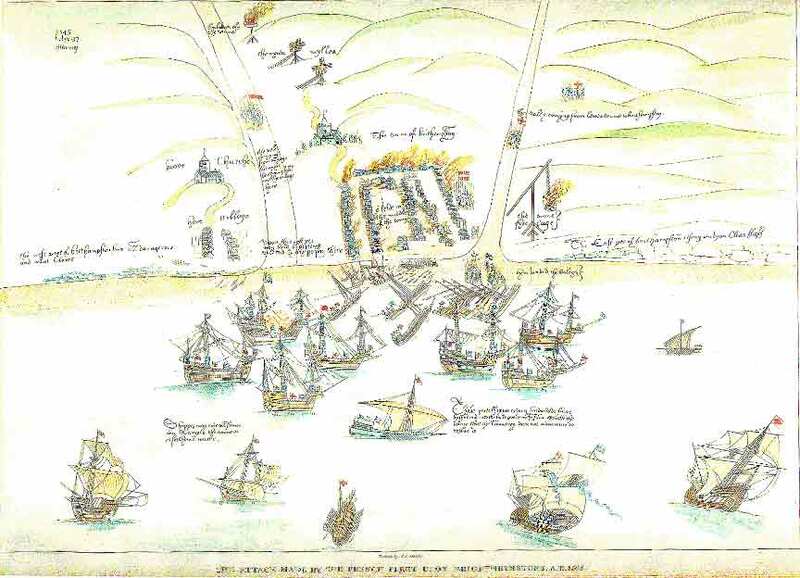 What happened during the skirmish at Rottingdean? There seems to have been two distinct phases to the skirmish. The first took place when the villagers tried to oppose the French landing in the chalk cliff gap south of Rottingdean. The second occurred when the prior of Lewes and his relief force of 500 men were defeated. By evening the French could see them at some distance, coming towards the village from the direction of Lewes. They therefore prepared an ambush with 300 horsemen and allowed the prior's force to come quite close before attacking. The English were surprised and put to flight with the loss of one hundred men. Walsingham informs us that the prior was captured, together with his subordinates, Sir John Falvesley, Sir Thomas Cheyne and the esquire John Brocas. Lt-Colonel Green describes a straightforward clash between the two forces on a ridge-top north of Rottingdean, but admits ‘there is no actual evidence where the battle was fought’. However, Froissart's account indicates that it might have taken place in the village itself. He states that after the French had beaten off local resistance at the landing place, they marched onto Lewes where they met the Prior's forces ‘in a convenient square in front of the monastery’. After many feats of valour had been performed, the outnumbered English were defeated with the loss of two hundred men killed, although the French also suffered heavy casualties, notably from the English longbowmen. There is no evidence to suggest that the French reached Lewes itself. The English chroniclers would have mentioned it. However, it is noteworthy that there is a ‘convenient square’ in the middle of Rottingdean - the village green - with the church lying on the eastern side. Was the English relief force allowed to enter Rottingdean before being ambushed by the French? Who took part in the skirmish? Froissart tells us that there were many 'important ... rich men from the surrounding parts who had come there to win honour'. Walsingham's account provides us with the names of four of these men. An entry in the Close Rolls supplies a fifth. Who were these men and why did they fight at Rottingdean? What previous military experience did they have, if any? In 1377, the prior of Lewes was a Frenchman called John de Caroloco or Cherlieu. He had been prior for approximately eleven years and was probably in his forties at the time of the skirmish. The priory belonged to the Cluniac order, with its parent house in France. During wartime, 'alien' houses were normally taken into the king's hands, but this does not seem to have happened with Lewes priory in 1377. As we have seen, the prior was defending the coast against the French in response to an appeal from the king for his bishops to arm and array all abbots, priors and other ecclesiastical persons within their respective dioceses. They were expected to arm themselves according to their ‘estate, possessions and means’ and D'Orronville tells us that the prior was captured wearing armour covered with red velvet. However, the prior had a more personal reason for defending this part of the Sussex coastline as many of the lands in Rottingdean belonged to his priory. They, and the people who worked upon them, were valuable assets worth protecting and their destruction later caused the priory considerable financial hardship. John Brocas was born circa 1351 and belonged to a family of Gascon origin that established itself in England during the reign of Edward II. In Sussex, he originally held only the manor of Shopwyck in Oving, which came to him from his maternal grandfather Thomas de Hever. This was held from the Earl of Arundel by knight service. However, Brocas later inherited lands at Blatchington by Seaford, Ripe, Selmeston, Exceat, Ewhurst and Sompting when Sir Andrew Peverel, his mother's maternal uncle died on 3 February 1375. Brocas held these lands from the Duke of Lancaster. With the exception of Shopwyck, Ewhurst and Sompting, all lie within a ten-mile radius of Rottingdean. John Brocas was therefore following the late king's command of 16 March 1377, which was repeated again on 14 July, for all persons with lands adjacent to the sea coast to abide upon them and help defend the realm from the French. Failure to do so could result in forfeiture of lands, goods or chattels by the sheriff. Little else is known about John Brocas other than he held the rank of esquire. He was a young man in his mid-twenties. It is not known whether he had any previous military experience. There is no contemporary evidence of the arms borne by John Brocas, but his grandfather of the same name (died 1365) - 'one of the favourite knights of the Black Prince' and a veteran of Poitiers - bore the arms 'sable, a lion rampant guardant, or'. These were later borne by his uncle, Sir Bernard Brocas (died 1395) and appear on his tomb in Westminster Abbey. Sir Thomas Cheyne had probably been a life retainer of the Prince of Wales. In 1363, he made a settlement regarding his lands in Billingshurst and Houghton as he was about to go abroad. In July of the same year, the Prince of Wales left Plymouth to take up his new appointment as Prince of Aquitaine. Sir Thomas was later present at the Prince of Wales' victory at the battle of Najera (3 April 1367), in Spain, where he captured the famous French commander, Bertrand du Guesclin. Shortly after his return to England in 1371, the Prince promised to pay Sir Thomas £1,483 6s 6d for his captive. In December of the same year, Sir Thomas obtained the manor of Farnborough from William de Spridlyngton, later bishop of St. Asaph. Sprydlington was an important member of the Prince's council. Sir Thomas' life retainer with the Prince ended with the death of the latter on 8 June 1376. It is possible that he entered the service of the Earl of Arundel, but there is no direct evidence to confirm this. However, it is perhaps noteworthy that Sir Thomas' maternal uncle, John Houghton shared lands in Houghton village with the Earl. Were Sir Thomas and Sir John Falvesley two of the 400 lances raised by the Earl of Arundel to defend the Sussex coast on the understanding that the inhabitants would pay for their upkeep? Were both men stationed in the Earl’s castle at Lewes? The date of Sir Thomas' birth is not known but at the time of the skirmish he was probably in his mid-thirties. However, there is evidence to suggest that he might have been much older than this, perhaps in his mid-sixties. Sir Thomas’ distinctive arms appear on a seal appended to a document in the British Museum dated 3 February 1372. They also appear in the Surrey Roll of Arms (circa 1392-7), where they are emblazoned 'azure, on a fess nebuly, between three crescents or, a fleur de lis gules'. Sir John Falvesley was born circa 1335 and was therefore in his mid-forties at the time of the skirmish. At the age of 17 he inherited his father's manor of Fawsley in Northamptonshire. Nothing further is heard of him until April 1365, when he was about to go to Ireland with Lionel, Duke of Clarence. Falvesley was probably a life retainer of the Duke and may have accompanied him to Italy in 1368. The Duke went there to marry Violante, the daughter of Bernarbo Visconti, ruler of Milan. Lionel died in October of the same year and Falvesley probably joined the retinue of Edward Lord Despencer soon after. Despencer, who also accompanied the Duke to Italy, subsequently joined the White Company, a band of predominantly English mercenaries fighting for the Pope against the Visconti. Despencer returned to England in August 1372 and, in November of the same year, Falvesley witnessed an indenture for life service between Despencer and a Sir Thomas Arthur. Another witness was Sir Edward Dallingridge. In July 1373 Falvesley took part in the Duke of Lancaster's expedition to France as a member of Despencer's retinue. This was a particularly tough campaign, with Lancaster's army marching nearly 1,000 miles through the heart of France from Calais to Bordeaux. Approximately half of his 15,000 army perished on the way. Despencer died in November 1375 and Falvesley appears to have joined the retinue of Richard, Earl of Arundel soon afterwards, otherwise it is not clear why he would have been present at Rottingdean. Falvesley may have entered Arundel's service through his acquaintance with Sir Edward Dallingridge. Dallingridge held lands in Sussex (Fletching and Sheffield, and later Bodiam castle) and was a member of Arundel's affinity at this time. However, the earliest evidence of Falvesley being in Arundel's service dates to 1381, when he is listed as one of the Earl's Chirkland feoffees. He did not hold any lands in Sussex until 1382 when he married, without the king's licence, Elizabeth, sister and heiress of John Say, a minor in the king's ward. Through his new wife, Falvesley acquired Buxted and Streat and the title of Lord Say. Sir John Falvesley's arms were 'or, two chevrons gules, a crescent sable in dexter chief'. A plaster cast of his seal can be seen in the British Museum and was probably made from an impression appended to a document dated 1 March 1387. In the early nineteenth century, this was in the possession of a G. W. Finch Hatton of Kirby. The tinctures come from Glover's Ordinary. Thomas Wilford was a clerk of Chancery in the royal household. At the time of Rottingdean, he was parson of Ardingley and prebend of Hempstead in the cathedral church of Chichester. He obtained both these benefices on 29 February 1376 through an exchange with Master Robert de Wenlyngburgh. Thomas was probably obliged to dwell on his Sussex lands following the king's appeal to the bishops of England to arm and array their clergy. The only other individual mentioned at Rottingdean is a French esquire, who had long been in the service of the prior. Walsingham does not give his name, but he bravely fought against his fellow countrymen and was mortally wounded after being pierced in the stomach by swords. Lt-Colonel Green states that the prisoners were carried back to France where negotiations were undertaken to ensure their release on payment of ransoms. D'Orronville informs us that Jean de Vienne held the prior of Lewes a prisoner for a year. The prior was eventually released on payment of 7,000 nobles, or approximately twice the annual income of the priory in 1391. He subsequently returned to Lewes, and remained there until his death in 1396. Sir Thomas Cheyne was probably still a prisoner in France on 29 May 1378 when his executors, his brothers John and William Cheyne, John Houghton and Sir William Berland were named as patrons of his manor of Farnborough. He may have been released soon after Easter 1379, for a possible down payment of 300 marks, the first instalment of the debt owed to him by the late Prince of Wales for Bertrand du Guesclin's ransom. Sir Thomas died before 30 March 1381, when the Bishop of Winchester granted his executors discharge of his will. It is possible that he was buried in London, where his brother William was an important officer in the law courts. John Brocas was not so lucky. According to the inquisitions post mortem mentioned above, he is said to have died on 26 September 1377, just a month after the skirmish. A wound probably caused Brocas’ death, as he was still a young man. A seventeenth century inscription erected in Westminster Abbey, behind the tomb of his uncle, Sir Bernard Brocas (died 1395), lends credence to this theory. It states that Sir Bernard's 'elder brother, Sir John', was 'slain in an engagement with the French near Southampton'. The inscription contains a number of inaccuracies and the reference to the engagement at Southampton is probably a muddled one to Sir Bernard's nephew's presence at Rottingdean. John probably died in captivity. He left no children and his widow, Sybil, subsequently married John de Uvedale. His Peverel lands in Sussex went to his kinsman and heir, Sir Edmund Fitzherbert. It is not clear when Sir John Falvesley was released or how much he was ransomed for. However, he was back in England in 1382 when, as we have seen, he married Elizabeth Say. He appears to have been a favourite of the Earl of Arundel and later rose high in his service, accompanying him on his naval expeditions to Sluys in March 1387 and France in June 1388. Sir John died in 1392 and was buried in Lewes priory, the final resting-place of the Earls of Arundel. He left no issue. Thomas Wilford was probably released before 14 May 1378, when the king pardoned him for non-payment of two-tenths of his income. In 1379, it was rumoured that Thomas was going to 'pass to foreign parts, there to prosecute many things to the prejudice of the king and people'. Was he was going abroad to sort out payment of his, or another person's ransom? Whatever the reason, he seems to have answered the charge to the king's satisfaction, as there are further references to him in the Close Rolls up to 1387. ‘Ware the abbot of Battle, when the prior of Lewes is taken prisoner’. Even up until the beginning of the present century, the skirmish lived on in local memory. Lt-Colonel Green recounts how his wife was ‘warned as a child about the bogey of the pirates of Rottingdean, if she were naughty’. Her family lived in nearby Telscombe. · The skirmish took place in late August 1377, probably on the 27th and not in early July as previously thought. · Although the prior was in command, he was supported by at least two knights who had experience of wars on the continent. · The prior's force contained at least one local landowner of substance, as well as clerics and peasants. Many of the later were armed with the longbow. · The prior's defeat and capture probably took place on the village green in Rottingdean itself after being ambushed in the evening by Jean de Vienne’s cavalry. · Lewes town was not burnt and the destruction caused by the French in this part of the Sussex coastline was limited to Rottingdean and a few neighbouring villages. · The key prisoners spent lengthy periods of captivity in France; at least one died there before his ransom could be arranged. The ransoms paid were substantial. Walsingham (An early English translation of Walsingham’s Latin text, taken from Higden’s Polychronicon, Volume 8, pages 446-7). After that men of France entered into the Isle of Wight, and did great hurt; which taking a thousand marks for ransom returned to the sea, keeping the coasts of England, and burning many noble places, slaying men whom they could find in the south parts, and taking many beasts with them. For more hurt was done in England in that year, as it was said, than in the forty years afore. Also men of France made an assault to the town of Winchelsea, but they could not enter into the town, nevertheless they sent diverse men which burnt the town of Hastings. Also men of France entered in the same year into the town of Rottingdean, in Sussex, where the prior of Lewes met them with a little number of people, which was taken and brought to their ships with other two knights, Sir John Falvesley and Sir Thomas Cheyne, with a squire John Brocas. But a squire born in France being in the service with the said (prior) fought manfully against men of France, in so much that his belly (was) cut, he fought sore, his bowels remaining behind him a great space, and followed his enemies. In which conflict a hundred Englishmen were slain, and many more of the Frenchmen; which took the dead men away with them, other else they burnt their faces with iron that they should not be known, and that Englishmen should not solace of their death. Where a man of France was taken, confessing afore his death that the realm of England should not have been troubled by the men of France if that the Duke of Lancaster had been made king. Froissart. An English translation taken from P E Thompson’s ‘Contemporary Chronicles of the Hundred Years' War’, London 1966, pages 176-7. As they sailed along the coast of England, Jean de Vienne and Jean de Rye, the French admirals, and the Spanish admiral harried the land and made every effort to force a landing for their own advantage. They came shortly before a considerable town near the sea called Lewes, where there is a very rich priory. The people of the surrounding country had taken refuge there with the prior and two knights, Sir Thomas Cheyne and Sir John Falvesley. The Earl of Salisbury and his brother were unable to get there in time, because of the rough roads and difficult going between Lewes and the country they were in. The French reached the port, which they entered information, bringing their ships as close to the land as they could; they effected their landing in spite of the English defenders, who did what they could. As they entered Lewes there was a deal of fighting, and many French were wounded by arrows; but they were so numerous that they drove back their enemies, who gathered in a convenient square in front of the monastery to await the foe approaching in close order for a hand-to-hand fight. Many noble feats of arms were performed on both sides, and the English defended themselves very well considering their numbers, for they were few in comparison with the French. For this reason they exerted themselves all the more, while the French were all the more eager to inflict losses on the. Finally the French conquered the town and dislodged the English; two hundred of them were killed and a large number of the more important men taken prisoner, rich men from the surrounding parts who had come there to win honour; the prior and the two knights were also taken. The whole town of Lewes was ransacked and burnt or destroyed, together with some small villages round about. By high tide the French were already back in their ships, and they set sail with their booty and their prisoners, from whom they learned of the death of King Edward and the coronation of King Richard. Jean Cabaret D'Orronville. La Chronique du bon duc Loys, 1876, pages 71-2. An English translation from the original French text by Mr D. A. Crowder. And Messire Renier de Grimaldi having returned bringing the things that he had promised, to the Admiral, they embarked their army for the crossing, numbering 400 horses and 2,000 troops, both men-at-arms and support troops, and they reached the coast of England, where the English on the coast tried to prevent them from landing, but without success because the Admiral and his force landed and pursued them for a good league and more as far as Rye; and in that pursuit many English were killed. And the town was then taken, overrun and burnt that day, when many people were killed and a fair number taken to the vessels as prisoners, and an abundance of cloth and other riches of many kinds were seized. And a wealthy English prior, known as the Prior of Lewes, who had learnt of the emergency from the refugees from Rye, reaching his monastery, which was not far away; had assembled a large force to drive out the French if he could. And to this end, during the evening the prior arrived with a good 500 troops, some of the best men he had; but the Admiral, who was no fool and had a strong suspicion that someone would arrive, had laid a great ambush of 300 cavalry, hand-picked men. They saw the English coming a long way off and let them get close, then they emerged from ambush and attacked them, routed them and captured their leader, who was wearing armour covered with red velvet; and the Prior of Lewes became the Admiral's prisoner as his share of the spoils and was held captive for a year, and the Admiral was paid a ransom of 7,000 nobles. The Admiral with his fleet withdrew from Rye honourably and without loss and went to Paris to join the King. Lt. Colonel Howard Green: Guide to the Battlefields of Britain and Ireland. 1973. Montagu Burrows: The Family of Brocas of Beaurepaire and Roche Court. 1886. Sussex Archaeological Collections, Volume 65, 1924: Sussex Domesday Tenants: The Family of Chesney or Cheyne by L F Salzman. Thomas Fuller: The Worthies of England Edited by John Freeman, 1952 (Local proverb on the Abbot of Battle).